Edward wrote one of the most beloved novels of my childhood, David and the Phoenix (published 1957, though my childhood came later). This year, I interviewed Edward. To my disappointment, he had almost no photos of himself. Then I met him in person, and surprised him. It's from the Third Book of Junior Authors (1972), but because Edward said he was still getting letters about David and the Phoenix "twelve years later," it's apparent that he wrote this in 1969. 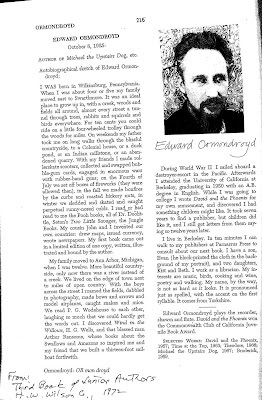 Posted 7:04 AM Labels books by other authors, Edward Ormondroyd, where are they now? Thanks for these updates, Marc. 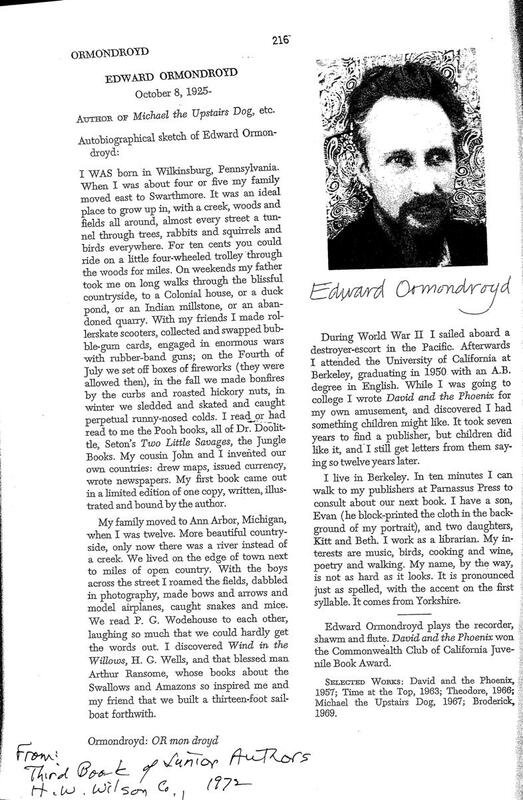 I love to read about Edward Ormondroyd and to know there are others who love "David and the Phoenix". It's like being a member of a special little club.